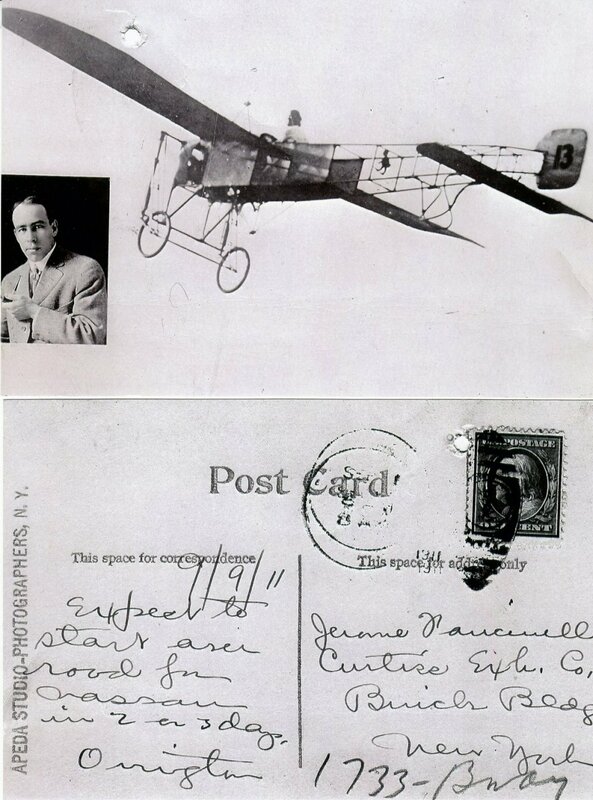 Known to his Bluemont neighbors as a Ford truck dealer, Jerome Fanciulli was also a well-known turn-of-the-century promoter whose abilities as a reporter, manager, marketer, event organizer, salesman, and talent-spotter helped to usher in the age of flight. By staging flying demonstrations all around the country for aviator and businessman Glenn H. Curtiss, Fanciulli helped establish in the public mind that what had yesterday was impossible—pilot-directed, motorized flight—had become a reality. 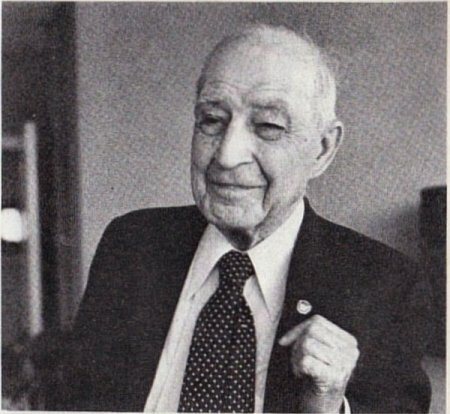 At the Ford company from 1912 to his death in 1986 at the age of 98, Fanciulli managed groups of salesmen and landed contracts for fleets of trucks for businesses and government agencies. At age 55 Faciulli came to Bluemont in 1943, his wife having inherited the striking Queen Anne’s house and land from Robert Marshall. Long-time Bluemonter Martin Mitchell was just a young teenager when he started mowing the lawn for the Fanciullis. Childless, Fanciulli became fond of Martin. “I was like a kid to him,” Martin recalls. This article draws on original documents that Fanciulli’s neighbor Martin Mitchell made available for scanning . It describes Fanciulli’s relationships with some of air-pioneering celebrities, including Wilbur and Orville Wright, Glenn Cutiss, and stunt flyer Lincoln Beachey. 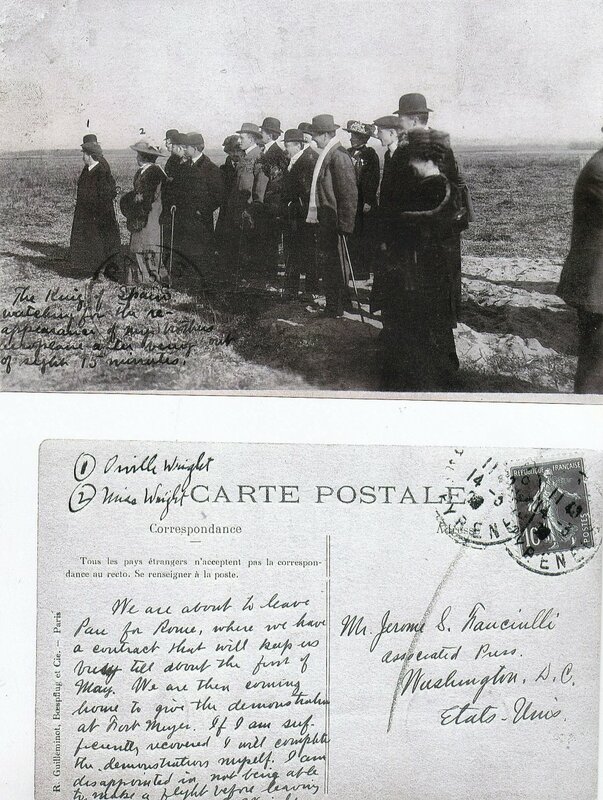 Martin provided two postcards sent to Fanciulli by the Wrights. The first card, bearing a French stamp, shows a group of people standing in a field, all gazing left. There are numbers inked on the picture above two heads. The number 1 identifies “Orville Wright”—while 2 indicates “Miss Wright” (Katherine Wright). While still in his teens in New York City, Jerome Fanciulli [1888-1986] had demonstrated his showmanship by managing a regimental band led by his father, who later became a leader of the U.S. Marine Corps band. In 1907, at the age of 19, Fanciulli worked as a reporter for the Washington Post and the Associated Press. 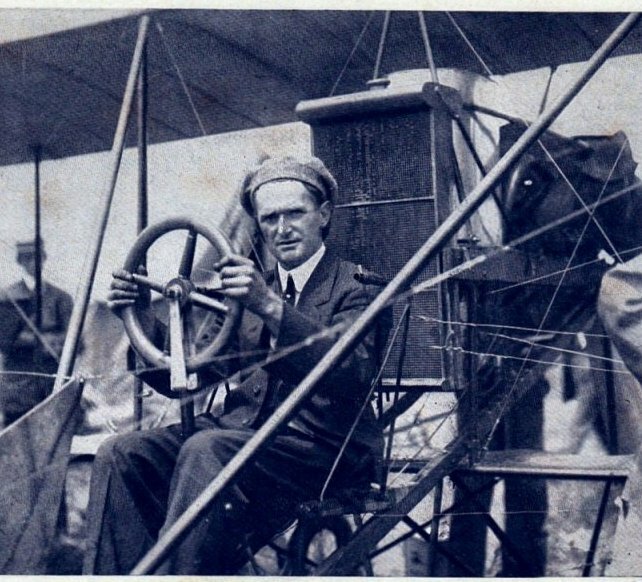 Making aviation his specialty, he covered the early flights of Wilbur and Orville Wright, Glenn H. Curtiss, and other aviators, himself learning to fly. 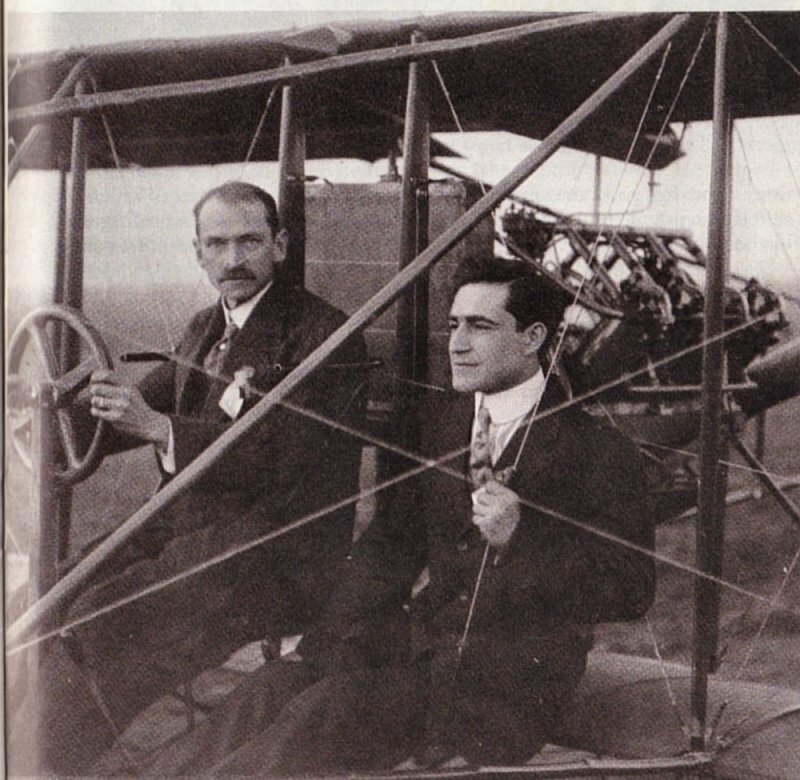 Covering a flying demonstration in California, he took the opportunity to ride with Curtiss as the aerialist’s first passenger (photo below). 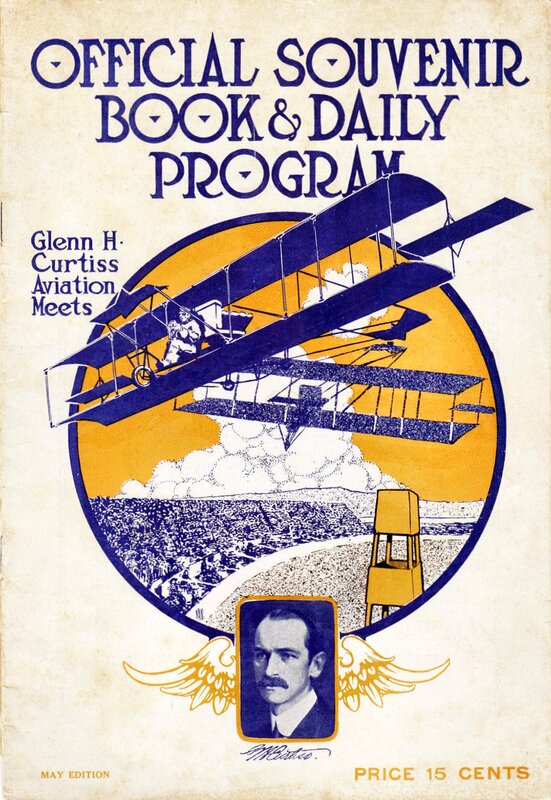 Fanciulli worked for aircraft business pioneer Glenn H. Curtiss from 1909 to 1912. As general manager of the Curtiss Exhibition Company he arranged air shows around the country, making the Curtiss name famous. Like the Wright brothers, Curtiss got his start with the mass marketing of bicycles around the turn of the century. Born in Logansport, Indiana, Curtiss (1898-1930) went from being a bicycle racer, to a Western Union bicycle messenger, to owning a bicycle shop, to manufacturing motorcycles and light-weight engines. In 1906, he set a speed record of 64 mph on one of his motorcycles . At first Curtiss and the Wrights were friends and business associates, but the two companies became embroiled in patent lawsuits, which Curtiss eventually lost. Curtiss went his own way, however, pushing the envelope of the airplane both as a test pilot and as a businessman. Still later, in 1929, just before Curtiss’s death, the two enterprises merged as the Curtiss-Wright company. Curtiss trained military pilots, experimented with dropping objects weighing as much as bombs, shooting at ground targets, and sending radio messages from the air. He flew from Albany to New York City in 1910, setting a distance record and winning a $10,000 prize. In 1912 he developed the hydroplane, which was an immediate success, finding buyers in the U.S. military and other countries. A souvenir booklet from May 1911, apparently written and put together by Fanciulli, highlights Curtiss’s achievements, providing a time-capsule shapshot of the history of manned flight up to that year and speculating on the future. The booklet, with a dramatic blue and orange cover design, includes photos of Curtiss piloting airplanes, giving a test ride to an “Indian Princess,” and flying over a “record breaking crowd” of 120,000 at a San Francisco Air Show. One article covers the Curtiss War Machine, sold to the U.S. Military, along with photos of several army and navy officers that Curtiss trained in its operation. 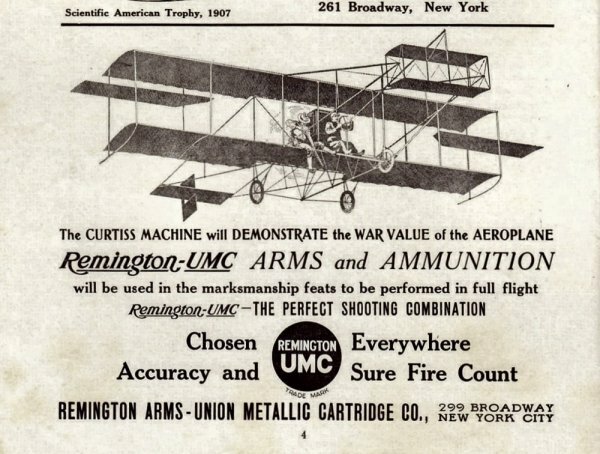 A Remington ad (below, right) states: "The CURTISS MACHINE will demonstrate the WAR VALUE of the AEROPLANE." In an interview story, Fanciulli quotes Curtiss on the potential of the hydroplane to deliver mail, reach remote areas, and save lives. Fanciulli returns to this theme in a 1912 article published in National Waterways: A Magazine of Transportation. It presents the case for the potential of inland waterways as ready-made landing fields for hydroplanes. 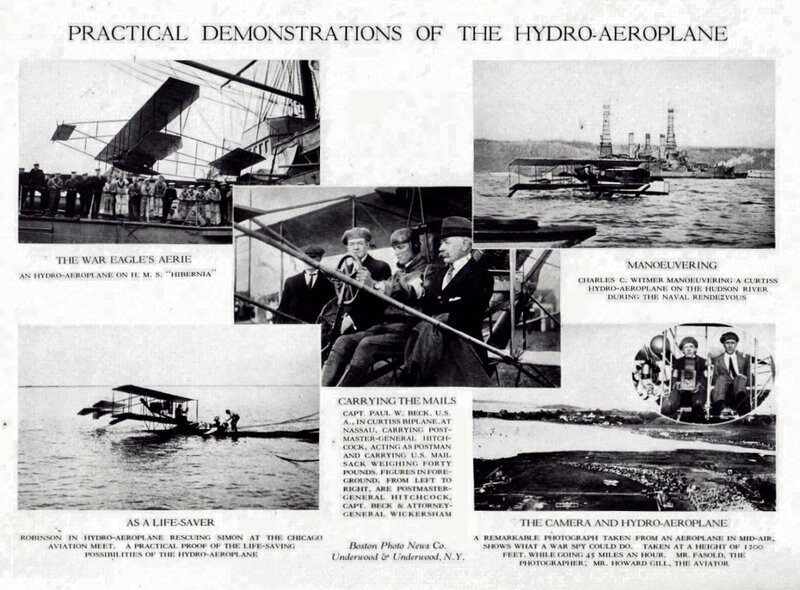 A picture spread shows the hydro-aeroplane's many uses, including mail carrying and rescue. This article shows Fanciulli’s flair for mixing the latest technical information with marketing possibilities. National Waterways was a trade journal published by the National Rivers and Harbors Congress, an association that advocated regular federal infrastructure funding for American waterways. Another story in the same issue—with a picture of President Taft—celebrated the 1912 passage of the River and Harbor Bill (R.R. 21477), which appropriated $32 million for local waterway development around the country. Left: Beachey in the pilot seat. The caption reads: "Beachey didn't fool with puttees and riding breeches worn by other fliers. Tradmark was blue-and-white checkered cap." “The correctly billed death defiers had performed brilliantly. A man went up hanging by his knees from a trapeze bar until he vanished from sight. A horse and rider went up in a basket, the rider waving his cowboy hat and firing blanks from his pistol. A dog was dropped by parachute to land in the center of the field. No one had gone smash. The crowd was almost apathetic. “The Beachy came along, flying at treetop level. The wind was just right, a gentle breeze well within the control of his rudder, and blowing away from the grandstand. He was balanced nicely, well forward on the catwalk, with the rudder ropes running on either side of him, as he pulled it close. He swept almost across the heads of the spectators, and gave them their money’s worth. But there must have been something about the sight of a human figure, so close to them but soi far removed by the power of flight that created a form of madness in the crowd. “As Beachey tossed over his landing rope, the crowd surged forward as a unit, broke through the rails, swarmed over Beachey’s ground crew, beating them down. Yelling men grabbed the landing ropes. They pulled, they hauled, they wrenched. Beachey in horrified alarm, killed his engine lest its propeller start slicing skulls. (He never did that again). Beachey soon figured out, however, that if he stood up immediately after landing, he could talk down the excited crowd and take command. According to author Hans Christian Adamson, it was Fanciulli who understood the crowd appeal of Beachey’s free-wheeling, aggressive flight style—later to evolve into the aerial dog fights of World War I. “’Where?’ snorted Beachey, looking at the blank envelope. “’Glenn Curtiss—That’s where,’ replied Knabensue. “’For three reasons—first because Glenn Curtiss has more showmanship than the Wrights—look at his flight last May from Albany to New York. Second, with the Wrights crowding Curtiss in the courts with their patent-infringement suit, Curtiss will need cash from exhibition flights to fight back. And the Curtiss exhibition team will be managed by one of the savviest press agents in the business—Jerry Fanciulli. With some qualms, Curtiss taught Beachey to fly his airplanes. Beachey became a stunt pilot superstar, nicknamed “the man who owned the sky.” He was wealthy and famous. Some excoriated him, however, for tempting other youngsters, by his example, to take risks that could prove deadly. Beachey himself died in 1915, age 28. He crashed after the wings came off coming out of a loop in a Curtiss air show at the Pan Pacific International Exposition near San Francisco. Although remaining interested in aviation all his life, this phase of his life lasted only a few years. In 1912, Fanciulli went to work for Ford as a salesman. He came to specialize in trucks, selling thousands to individuals, companies, and government agencies over his lifetime. Ford officially came out with its first consumer truck model in 1917, but the Ford chassis—modified by inventive users—had been trucking on American roads well before that. “Fanciulli is still going strong at Steuart Ford. 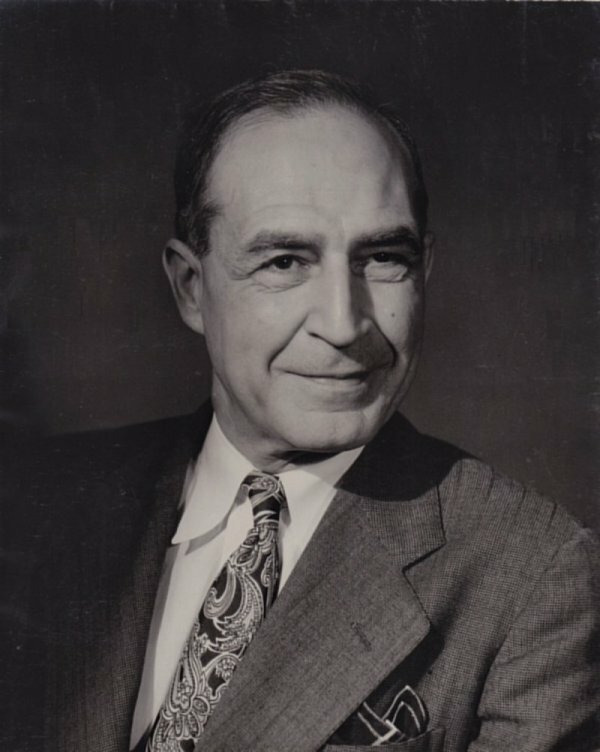 He joined the dealership in 1947, after leaving government service as the civilian chief of transportation in North Africa during World War II. Photo above, left: Jerome Fanciulli with his Ford '500 Club' pin. 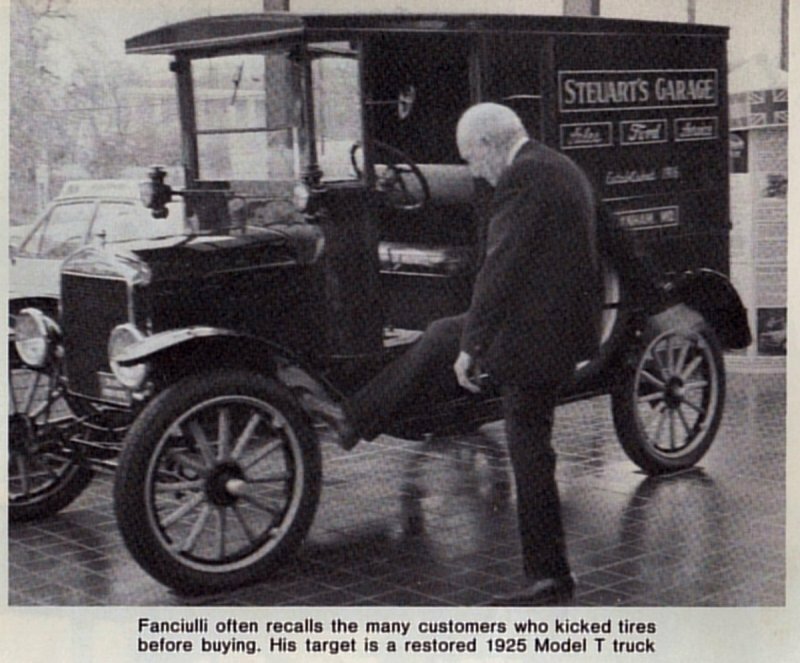 Below: Fanciulli demonstrates how customers used to kick the tires before buying on a restored 1925 Model truck. “At the last, I did more or less everything for him. Take him down back and forth to Washington [including to events at the Washington Press Club and Washington Areo Club]. “I took him to work in Lanham. I don’t know what he went for. We didn’t stay there. He’d go in the office, sit there and get on the phone and talk to somebody a few minutes. He’d sit ther3 and shuffle through his papers. And he’d say, ‘Let’s go eat.' So we’d get something to eat and then come on back home. "Evidently he didn’t have any certain time to be there or anything. More or less like he owned the place." After Fanciulli’s death, his papers went to the Collection History of Aviation Collection at the University of Texas at Dallas. A future story will discuss Martin’s work on the Mount Weather installation.